Everybody knows that, for websites usually is normal to be online, but often this is not the case. There may be plenty of different reasons for downtime of the website. It is always difficult to react at the moment, and even the lack of the website can be seen after a long period of time, 7-8 hours or a day. Probably you will say "This is not a big deal, they will fix it in two or three days", and you'll be right if this website is not your online store or your personal blog, which brings you a nice income. It is always different when it comes to you and your website. Do you know that the Downtime of your website leads to downing of its rank in search engines or even makes this rank disappear if the website is not accessible for search engine bots very often or for very long time? By downloading the rating in search engines you will receive worse ranking in search result and in the end visits in your website will be seriously reduced. Of course nobody is immune of downtime, but huge amount of these problems, which can cause this downtime are easy to avoid, if there is somebody who cares about the proper work of software and if measures are taken in time. This is one of the reasons for existence of website monitoring! We offer to our customers reliable remote monitoring service. Our servers can look after your website 24/7/365!  We will monitor web performance and technical condition of your website by observation of variety of factors. We will look for uptime and response time, SMTP service availability, HDD used and free space, presence of suspicious and malicious code on your website and possible cyber attacks. We can take care also for domain name expiration, SSL certificate expiration and validity, POP3/IMAP monitoring and many more..
You will receive notification for possible problems, warnings and errors. And never forget that all this data are a good source for reports and statistics. The purpose of this service is to ensure that your website is available to users 24/7, its downtime is minimized and has a high performance in The Net.